I love the few weeks leading up to Christmas almost as much as I love Christmas day. The holiday season is often full of wonderment, excitement, amazement, adventure, and love. This year, my family decided to kick off the holiday season with our own little Christmas adventure. It was simple, yet fun, and memorable. Try personalizing these fun activities to make a Christmas adventure that your children will always remember. 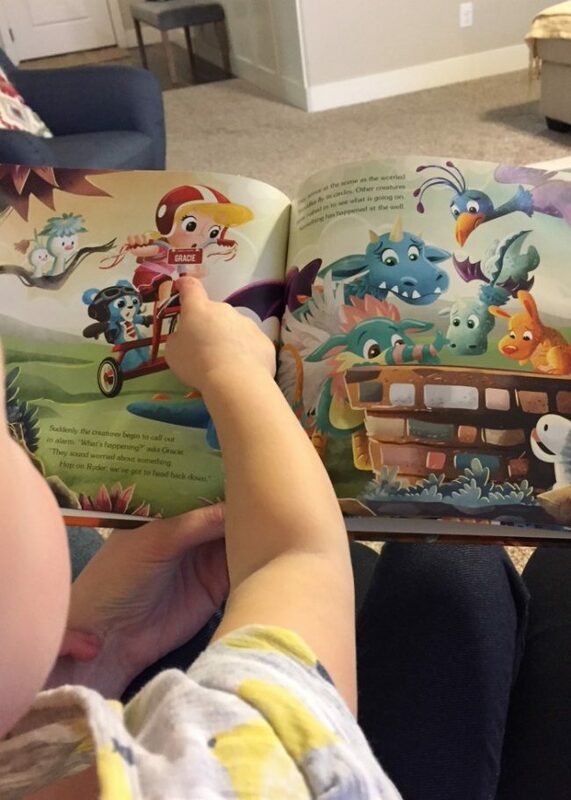 Start with a book – Storytelling is the perfect way to make any adventure come to life. To start your adventure, choose a book you want to use as a pattern for your adventure. The book my family chose was My Radio Flyer Adventure Book. In celebration of being a symbol of childhood imagination for 100 years, Radio Flyer teamed up with I See Me to create a fully customizable book that allows you to choose the main character’s name, hair color, skin tone, and Radio Flyer Product. Making this book for my daughter was so much fun! I was able to create a story about a little blonde girl named Gracie who goes on an adventure on her Radio Flyer tricycle to try and save Snoodles, the Dragosaurs, and other fun creatures. When we read the story together as a family, my little girl kept saying, “That’s me! That’s me!” Such a fun way to bring adventure right into our own home. 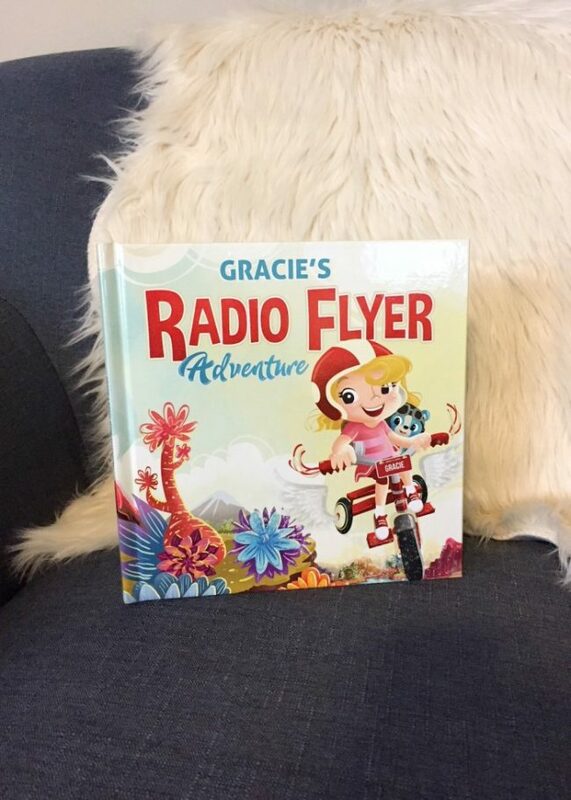 Make the story come to life – After we finished reading Gracie’s Radio Flyer Adventure we decided to create our own adventure. 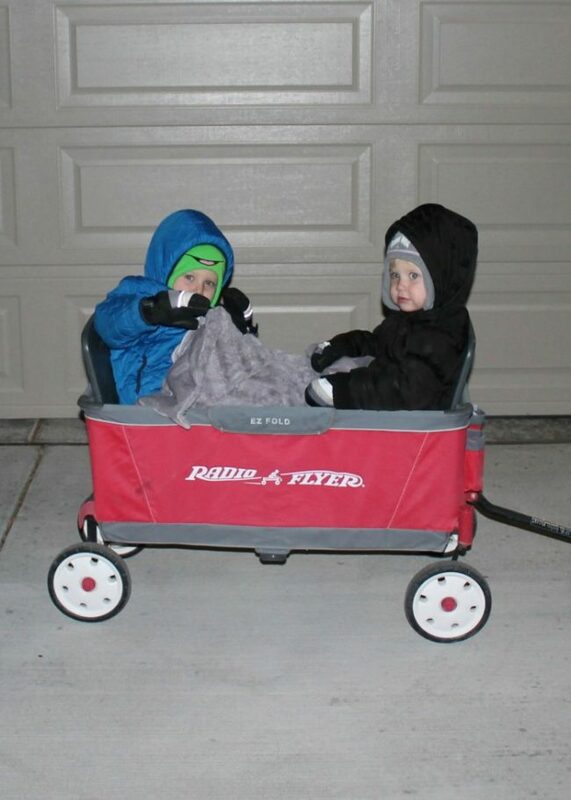 Just like the character in the book, we bundled up and hopped in our own Radio Flyer wagon for a fun evening. 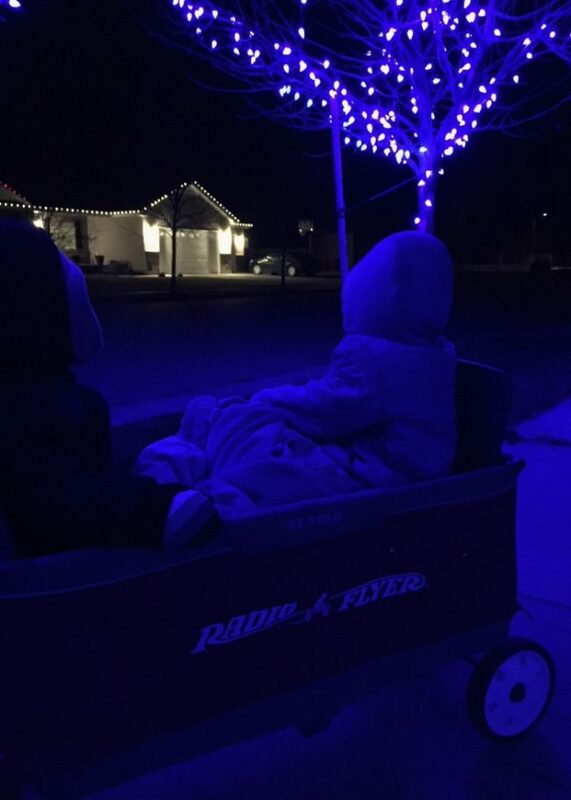 We decided our adventure would include seeing the neighborhood Christmas lights in the comfort of our favorite Radio Flyer wagon. Walking around the neighborhood with our Radio Flyer wagon took me right back to my own childhood; my mother used to pull my sisters and I in our little red wagon. With such great design and innovation, I can totally see how Radio Flyer has stayed relevant (being the world’s leading builder for wagons, trikes, pre-school scooters, and ride-ons) for 100 years. Radio Flyer’s founder, Antonio Pasin dream was to “bring joy to every boy and every girl” and I believe he has done just that! Although the evening was a little chilly, I loved seeing the magic of Christmas through my children’s eyes. Their favorite Christmas lights were by far these pretty blue ones. Plus, my kids could get as close to the lights as they wanted – another perk of walking instead of driving. Let the kids take part of the adventure – After we were finished looking at Christmas lights, the kids suggested that we go play on the playground with our flashlights. Although it wasn’t part of the original plan, it made for a very memorable night. 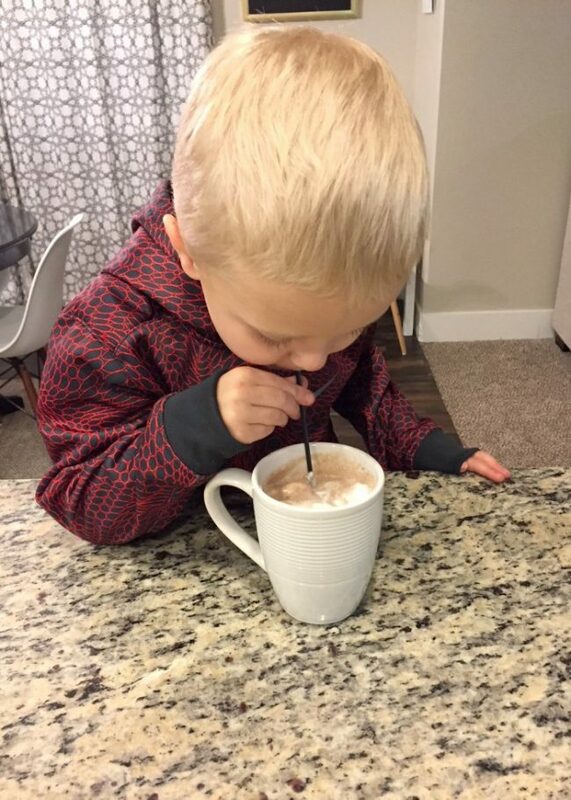 We ended our first Christmas adventure with a cup of hot chocolate. Yes, our Christmas adventure was super simple, but I loved every second it. 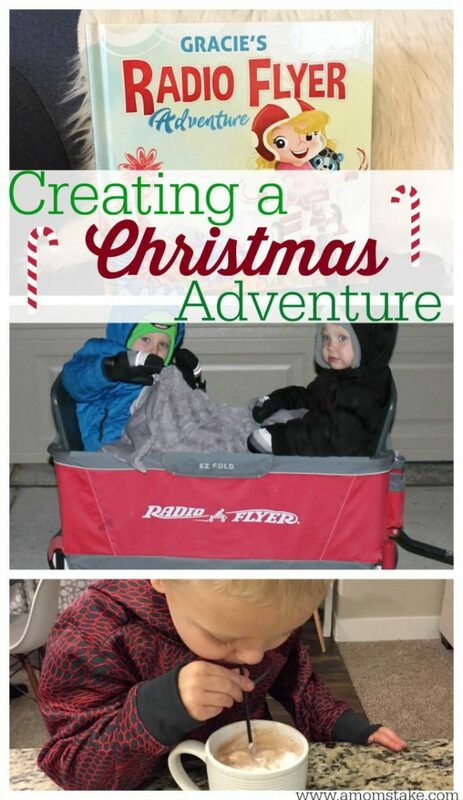 Don’t forget to order your own My Radio Flyer Adventure copy. Use coupon code MOMSTAKE15 for 15% off your book! Talk about a great Christmas gift or stocking stuffer! What would you include on your own Christmas adventure? These are all great suggestions! I am going to have to try some of these out this year. These are really great suggestions! I love the book! I am willing to bet it would be a great read over the holidays. We had a Radio Flyer wagon when I was a kid and it was well loved! I think the variety the product line offers is brilliant! What a cute adventure. I really like the customized book. If only my girls were that small again. It’s so fun to make Christmas time an adventure for the kids! We love doing new adventures for the kids each Christmas. It’s always a fun surprise for them. My boys love our radio flyers. Such a great part of childhood. I have a Radio Flyer wagon from many years ago. I used it as a child, and now I use it for my girls. They’re the best wagons too! How fun is this for the kids! I wish I had kids little enough for one of these Radio Flyers! What an adorable book and wagon! I know we grew up with this iconic brand that we all love! That looks like an awesome book to read over the holidays! I always loved to read with my son when he was younger and we definitely would have enjoyed that story. What a cute idea. The book looks great. I miss my kids being that little and doing stuff like that. That is a cute idea. My nephew is at this age right now and it would be fun to meet up milk and then be able to go out on the wagon and explore the adventure we decide to do. A Christmas time when I see him I might just do this. That is so great! I love the idea of turning Christmas into a real live adventure using a book like this. Very cool! Really, nice and creative suggestions. My kid will love these little adventures.